Ovarian Vein Embolization is used for the treatment of pelvic congestion syndrome, arteriovenous malformation, varicose veins, and other type of bleeding in women. 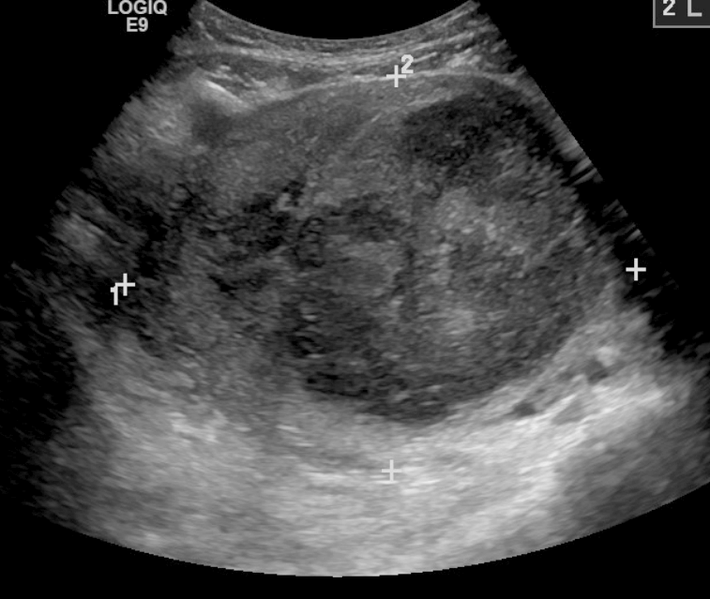 This is an ultrasound image showing a very large (9cm) fibroid of the uterus, which is causing pelvic congestion. The groin area is involved in the Ovarian Vein Embolization procedure. Why is the Ovarian Vein Embolization radiology procedure Performed? Fluoroscopy is used for image guidance and to guide the catheter to the faulty veins. There have been no recent advances in the Ovarian Vein Embolization procedure. What is the Cost of performing the Ovarian Vein Embolization radiology procedure? The cost of Ovarian Vein Embolization procedure depends on a variety of factors, such as the type of your health insurance, annual deductibles, co-pay requirements, out-of-network and in-network of your healthcare providers and healthcare facilities. How does the Ovarian Vein Embolization radiology procedure work? How is the Ovarian Vein Embolization radiology procedure Performed? An Ovarian Vein Embolization procedure is performed as an outpatient procedure at a hospital, or a surgery center. An interventional radiologist performs the Ovarian Vein Embolization procedure. An Ovarian Vein Embolization procedure may take from 30 minutes to several hours depending upon the severity of the condition. A physician will request your consent for Ovarian Vein Embolization procedure using an Informed Consent Form. What are the Limitations of the Ovarian Vein Embolization radiology procedure? In order for Ovarian Vein Embolization to be successful, the catheter must be placed at the precise position. If the catheter is not placed at the precise location, the embolic agent may not be effective. What is an Ovarian Vein Embolization procedure? What is to be expected during the Ovarian Vein Embolization radiology procedure? Sedatives or general anesthetics are used during the Ovarian Vein Embolization procedure. Since the procedure is a minimally-invasive one, the blood loss involved is minimal. What are the possible Risks and Complications during Ovarian Vein Embolization radiology procedure? What Post-Operative Care is needed at the Healthcare Facility after the Ovarian Vein Embolization radiology procedure? What is to be expected after the Ovarian Vein Embolization radiology procedure? What Post-Operative Care is needed at Home after the Ovarian Vein Embolization radiology procedure? Ovarian vein embolization may take few days to fully recover. Patient can resume normal activities within a week after the procedure. The Ovarian Vein Embolization procedure does not involve the removal of any body tissue. Who will you receive a Bill from, after the Ovarian Vein Embolization radiology procedure? The patient is advised to inquire and confirm the type of billing, before the Ovarian Vein Embolization procedure is performed.